Late last year, I signed up for a short-term volunteer work at the Society for the Prevention of Cruelty to Animals (SPCA) Singapore. I had enough time before our long holiday break in Manila so I grabbed the opportunity to work for that animal shelter facility in Mt. Vernon Road. I always wanted to volunteer in Manila whenever there’s a calamity but work and home duties did not seem to permit me. And guess what? It did not take a calamity for me to volunteer to something worthwhile and it felt really good. Volunteering at SPCA became my first official volunteer work. I started by contacting them through their website http://www.spca.org.sg. I got a quick reply that the only available volunteer position at that time was Shelter Helper. It meant helping the in-house shelter staff in cleaning the cages and in feeding the animals. That was the messiest duty among other volunteer positions in the shelter but I took the challenge and signed up. The shelter was a bus ride away from our home in Tampines. I met an Aussie student who also volunteered for the same job. We arrived almost at the same time and we were immediately dispatched to the battleground. There was not much orientation but who needs one anyway. We put on our working yellow boots, grabbed our long-handle brushes and pail of cleaning solutions, and started helping the staff who was cleaning the big dog cages. The work was not all easy and I could not imagine doing that everyday, but it was definitely a new and valued life experience. You feel happy when you see a staff able to finish his work faster and easier. One man doing all the cleaning for more than 10 dog cages definitely needed help. You also feel fulfilled when you see the dogs healthy and happy in their squeaky clean cages. There were also a cattery and a nursery for rabbits and hamsters. I was assigned in helping to clean that side of the shelter on my third day of volunteer work. I particularly washed all the feeding bowls and toys of the cats and rabbits. 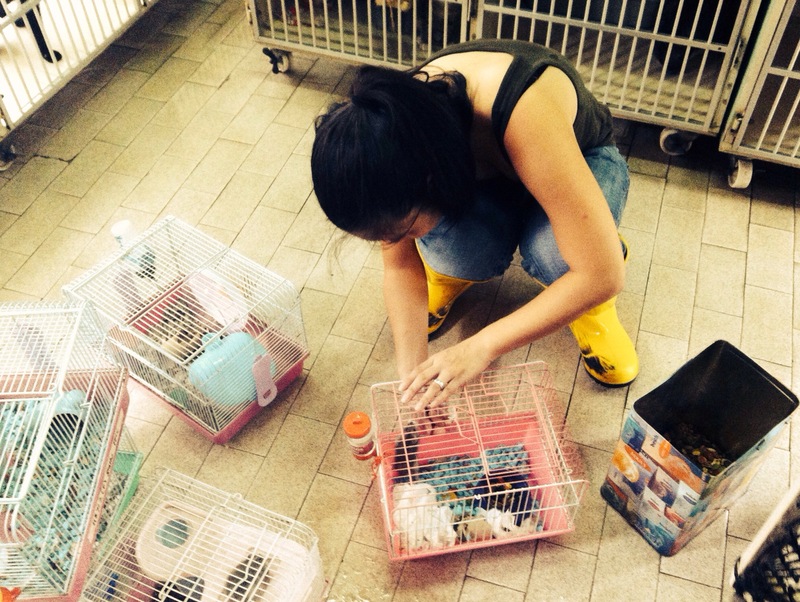 Three other volunteers did the cleaning of the cages. Then we all help out during the feeding which was fun. I though my daughter would love doing it if she was there. Here is Kent, a white local rabbit and Pete, a local white cat who both got some extra love and care from the volunteers that day. Kent and Pete, and the rest of their friends in the shelter need a new home and new family who will take care of them. You can invite the animals into your homes by being an animal fosterer or by adopting them. The thing is, you do not really have to spend money for a pet. You can save an animal’s life by getting one from the shelter and bringing them into your home. At SPCA, you could be a dog walker, a shelter receptionist, an animal ambassador, and others. If you are interested to get to know more about their volunteer opportunities, please click here. Wow! What you did for those animals is amazing! It sounds like you had a lot of fun as well. I hope you have a wonderful day!